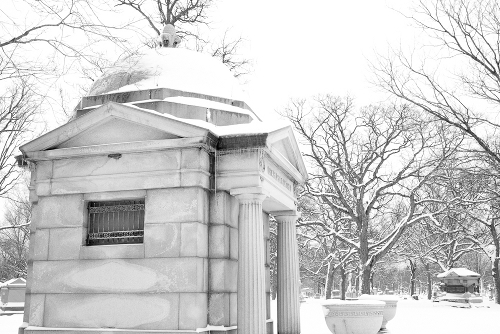 When I was working for a funeral home in Chicago, my office was in the administration building at Rosehill Cemetery. I’ve always loved cemeteries, and Rosehill is fantastic. The monuments are beautiful, and the place is steeped in history. There are Civil War soldiers, famous people, and a number of reported hauntings. The mausoleum has hallways of family burial niches, little rooms closed off by padlocked wrought iron gates through which you can see the sarcophagi, the mini altars, all suffused with light tinted by the Tiffany stained glass windows. Of course, the best part of being excited about something is sharing it with others. So one weekend I took a friend of mine who had similar proclivities to Rosehill to show him around. It was a cold and overcast day (in other words, your typical Chicago December). We started at my office, then headed toward the mausoleum, which was all the way on the other side of the (very large) cemetery. The road wound through the grounds, lined with headstones and statues and individual mausoleums, and was a very pleasant walk. By the time we got to the mausoleum, though, we were very grateful to be out of the cold. Once we had explored the mausoleum (lingering at the Shedd tomb, the largest in the building and a beautiful combination of opulence and decay) we headed back through the cemetery. It had started to snow while we were inside, and the fine layer of white accented the monuments, adding another layer of beauty to them. It was wonderful. Then the snow got heavy. We were a third of the way through when visibility narrowed to fifty feet. The snow covered the road, and shrouded the monuments in a thick blanket of white. My friend and I were in the middle of a huge cemetery with no road, no landmarks, and we were freezing cold. Obviously, we managed to make it out alive. (Unless this is being written by a ghooooost…wooooo! Okay, maybe not.) But what if we hadn’t? The cemetery is huge. Many parts of it are populated with graves that are old enough that no one visits them anymore. If we had frozen to death out there amongst the headstones, the heap of our huddled bodies covered with snow…when would we have been found? Perhaps we would have tried to pry the wrought iron gates open on one of the individual mausoleums. Maybe when we were found our fingers would be raw to the bone from scrabbling at the chains and padlocks and hinges. Maybe the cemetery would have had two more ghosts.